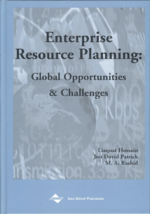 Enterprise resource planning (ERP) systems have an organizational impact and are in most cases implemented to improve organizational effectiveness. Shortcomings in current research make it difficult to conclude how an organization may be affected. This paper presents an artifact evaluation of the functionality and perceived benefits of ERP systems. The evaluation is based on the competing values model. The evaluation shows that ERP systems support effectiveness criteria (such as control and productivity) related to internal process and rational goal models. The evaluation also points out weaknesses in ERP systems and especially in areas related to human relations and open systems models. The result of the evaluation is used to discuss the impact of ERP systems on organizations and is presented as a series of hypotheses.